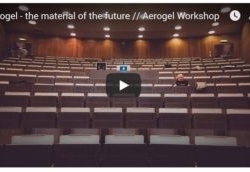 The fourth International Seminar on AEROGELS – 2018 is fast approaching. It will take place in Hamburg on 24 – 26 September 2018 in Hamburg. The Seminar is chaired by Prof Smirnova, Institute of Thermal Separation Processes, TUHH, and Dr. Michel Perrut, Atelier Fluides Super Critiques, Nyons, France.